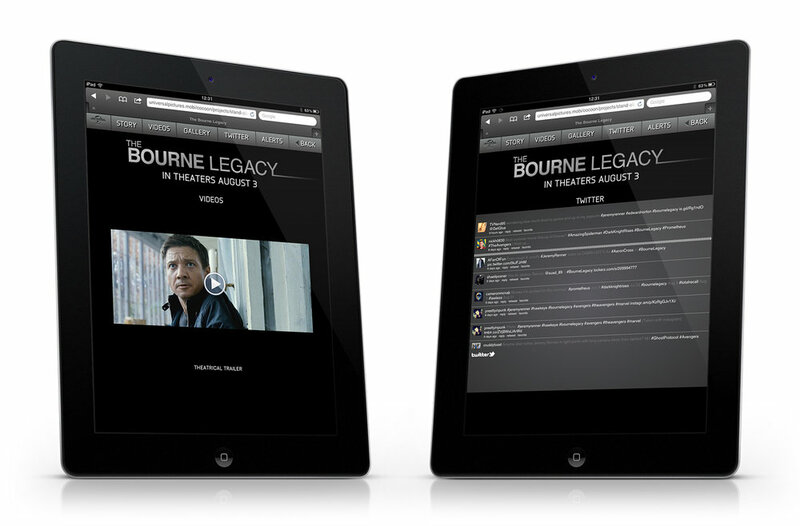 Website for 2012 film The Bourne Legacy. Optimised for iPads, smartphones and feature phones for the the USA, UK, Italy, Brazil, Spain and Portugal markets. Back in 2012, Universal Pictures still made websites for each of their films in Flash, which did not work on tablets or phones. At the time I was working at Net Mobile - a small mobile app and web agency in London. We redesigned all of Universal’s Flash-based film websites and optimised them for mobiles and tablets. Our agency made different versions of the website targeted to work for iPads, smartphones and feature phones. Smartphone: loading screen, story and gallery. We designed a fun loading sequence for the iPad version of the website. An animated cipher types out ‘loading’, as horizontal bars wipe across the black screen to reveal the main movie artwork. Localised versions of the smartphone website for Brazil, Italy and Spain. iPad: movie trailers and Twitter screens. iPad: sign up for movie alerts.